OBAMED Inc. is proud to present the first light-weight, FDA 510(k) approved, compact, portable Anesthesia Machine specifically designed for surgical locations where space or access is limited, such as Office Based Anesthesia and MRI scan rooms, or any location where size, mobility and portability are important. 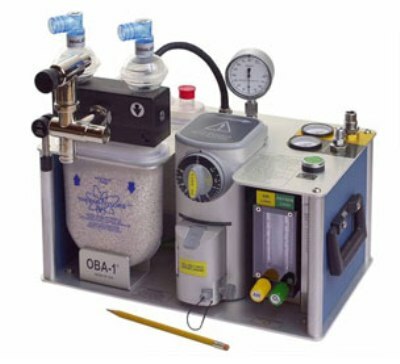 The OBA-1® and OBA-1® MRI units are equipped for use with oxygen and medical air, but by NOT providing nitrous oxide, the inadvertent administration of a hypoxic gas mixture is eliminated. The FDA approved OBA-1® MRI Compact Anesthesia Unit can be safely used in a MRI scan room with shielded or unshielded magnets. The OBA-1® MRI Unit may be placed within the 5 Guass line immediately next to the patient without interfering with the surgical or the scanning procedure. OBA-1® MRI Unit is being used in various MRI scanner models from Picker, GE and Siemens at 0.2 - 3.0 tesla. Remote locations in hospitals outside O.R.